The Olympic Movement officially recognizes women’s and men’s artistic gymnastics, women’s and men’s trampoline and women’s rhythmic gymnastics as Olympic gymnastics sports. Each sport requires specific equipment to compete in each event in the particular style of gymnastics. Women’s artistic gymnastics events include the balance beam, uneven bars, floor exercise and vault. The balance beam stands 1.25 m above the mat. The gymnast executes skills that require balance, such as leaps, flips and handstands, on the 10 cm wide apparatus. The uneven bars apparatus consists of two wooden bars held together by an adjustable metal frame. The gymnast adjusts the bars according to her height and preference, typically raising the high bar to about 2.4 m and the low bar to 1.6 m above the mat and spacing them about 1.8 m apart. The 12 sq m carpeted floor apparatus contains springs or foam padding. The gymnast performs a tumbling and dance routine choreographed to music utilizing the entirety of the mat. The vault apparatus is a solid platform placed at the end of a 25 m long runway. 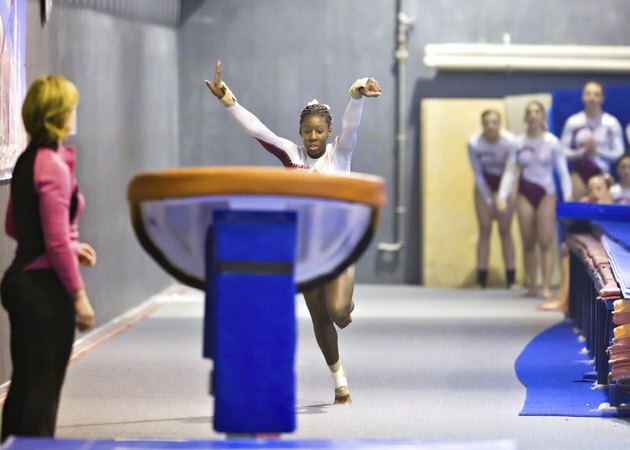 The gymnast sprints down the runway, hurdles onto a springboard and performs various handsprings and jumps over the vault apparatus. As the name suggests, a springboard consists of springs coiled between two boards. In addition to vault, the gymnast may use a springboard to mount the beam or uneven bars. Men's artistic gymnastics events include the parallel bars, high bar, still rings, floor exercise, vault and pommel horse. The parallel bars apparatus consists of two parallel wooden bars supported by a metal frame. The gymnast utilizes the bars to perform various swinging and balancing skills. The high bar is a single bar standing 2.75 m above the ground on a solid metal structure. The gymnast swings on the bar, performing various grip releases and re-grips. The still rings hang from flexible straps 50 cm apart and 2.75 m above the mat. The gymnast grasps the unsteady rings to perform skills that require body stillness and core strength. The equipment used for the men's floor exercise and vault are identical to the women's equipment. The pommel horse is similar to the vault apparatus but has two handles called pommels attached to the top of the platform. Gymnasts demonstrate strength and agility through coordinated hand placements and body movements over top of the apparatus. Women’s rhythmic gymnastics events include the ball, hoop, rope, club and ribbon. The gymnast incorporates the equipment into creative movements as she dances and tumbles. Gymnasts compete in each event on a 13 sq m carpeted mat. The ball, made of rubber or plastic, is 18 to 20 cm in diameter and weighs at least 400 g.
The hoop, made of wood or plastic, must have an inner diameter of 80 to 90 cm and a minimum weight of 300 g.
The rope is made out of hemp and is knotted at each end. The height of the gymnast determines the length of the rope. The gymnast uses two clubs for this event. The clubs, made out of wood or plastic, resemble bowling pins. The minimum weight per club is 150 g.
The ribbon is a 7 m strip of satin ribbon attached to a wooden stick. Holding the stick, the gymnast must keep the ribbon in constant motion throughout her routine. A trampoline apparatus consists of a nylon spring bed supported by a metal frame. The dimensions of a competition trampoline are 5.05 m long, 2.91 m wide and 1.155 m high. By bouncing on the trampoline, skilled gymnasts can reach 30 feet as they perform difficult flips and twists.